Some of the most beautiful and elegant animals living in Romania are the roe and red deer. Although they are the most common deer species in Europe and in Romania, it is rather difficult to see them, as they are discreet animals. However, it’s quite easy to distinguish them, as there are many differences between the two species. First, and probably the most obvious, it’s the size, with the red deer being three or four times bigger than the roe deer (picture below). The red deer is also the fourth-largest deer species, after moose, elk and sambar deer, with some of the largest of them being found in the Carpathian Mountains. The red deer stag (opening picture) can reach a weight of 280 – 300 kg. The roe deer’s coat is reddish brown in summer and grayish brown in winter. They are almost tailless, and the male has short antlers. By comparison, the red deer has a similar color but the males have big, branched antlers. The two deer species also have different ecological niches. The row deer occupies a wide variety of habitats, including deciduous, mixed or coniferous forests, especially the edge of forests, moorland, pastures and arable land. Meanwhile, the red deer prefer mountain areas with extensive forests. Both migrate, climbing up to alpine areas in summer and far down into the lowlands and the forests of the rivers in winter. They even have different predators. While the wolves usually kill the red deer, the roe deer is the main prey for lynx. However, that doesn’t mean that wolves don’t kill roe deer if they manage to catch them and lynx don’t kill younger red deer. The lynx normally kills about one roe deer a week, which translates into about 50 roe deer a year. A distinctive particularity of the roe deer is that, when alarmed, they make a noise that sounds like barking. Both the roe and red deer are species that can be hunted. While the roe deer is not extremely popular, the males being sometimes hunted for trophy, things are different when it comes to the red deer stags in the Carpathians, which are considered very big stags of the red deer species. Many come to Romania to hunt them, with hunting trips including walking through the forests to find the animal, sneaking up and calling the stag in by imitating its roaring. Hunting is allowed in autumn and early winter for red deer and in summer-autumn and a bit of winter for roe deer, and is banned in the periods when the fawns are born. The red deer usually give birth to one fawn around early summer while roe deer can have one or two fawns, born in the spring, by the end of May. Although habitat loss is not yet a real problem for deer in Romania, the fact that many guest houses and fish farms have been built in mountain valleys represents a problem because they have dogs which chase away and attack the deer when they migrate lower into valleys in winter. 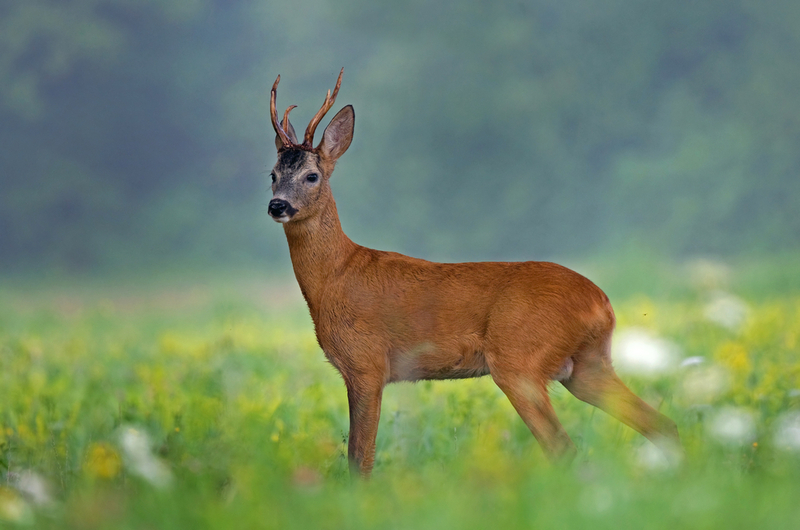 The main threat to both roe and red deer in Romania is poaching, usually for meat. However, nobody knows exactly how many roe and red deer are in Romania because it’s very difficult to monitor these animals. They live quite secretive lives and it’s quite difficult sometimes to see them. As for where they live in Romania, the lucky ones can spot a roe or a red deer almost everywhere. For example, although rare in the Southern plains, the red deer can be found for sure in all of the mountain areas and the Transylvanian hills, which are popular places among the roe deer as well. However, the roe deer prefer the hills and the edges of small forests, where they can feed on shrubs and bushes. The red deer have also been present along the Danube and in the Danube Delta. The two deer species can also be found in most of Europe, even in Scandinavia, as they are the most common deer species on the old continent.